Schott Music (German: [ʃɔt]) is one of the oldest German music publishers. It is also one of the largest, and is the second oldest, music publishing houses in Europe. The company headquarters of Schott Music were founded by Bernhard Schott (10 August 1748 – 26 April 1809) in Mainz, Germany, in 1770. Schott Music is one of the world’s leading music publishers. It represents many important composers of the 20th and 21st centuries, and its publishing catalogue contains some 31,000 titles on sale and over 10,000 titles on hire. The repertoire ranges from complete editions, stage and concert works to general educational literature, fine sheet music editions and multimedia products. In addition to the publishing houses of Panton, Ars-Viva, Ernst Eulenburg, Fürstner, Cranz, Atlantis Musikbuch and Hohner-Verlag, the Schott group also includes two recording labels, Wergo (for new music) and Intuition (for Jazz), as well as eight specialist magazines. Representing composers and authors from all over the world, Schott Music has offices in ten countries with some 270 employees principally in Mainz, London, New York and Tokyo, with additional offices in Beijing, Madrid, Paris and Toronto. The Schott publishing house was founded by Bernhard Schott (1748–1809) in Mainz in 1770, the year of Beethoven's birth. The building, dated and now under a preservation order, is still the company's head office. At the time of the foundation of the publishing house, Mainz boasted a flourishing cultural life and a busy court chapel. In 1780, Bernhard Schott was awarded the 'privilegium exclusivum' together with the title of 'Court music engraver'. This meant that within the boundaries of the electorate of Mainz no third party was allowed to re-engrave or sell the works produced by him. Schott was one of the first publishers to use the printing technique of lithography, which meant that his editions were soon being printed and distributed on a wide scale. During the French years of Mainz, the publisher suffered from high taxes, but the affectation to French music helped him in this stage. As a later consequence, the publishing house rapidly became established beyond the national borders of Germany. 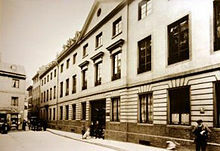 As early as 1823, Schott founded a branch in Antwerp, followed by Brussels in 1839, and further offices in musical centres such as Leipzig, London, Paris and Vienna. From the very beginning, it was its commitment to contemporary music that earned the publishing house its international reputation. Initially, the publishing programme included works by composers from the Mannheim School such as Carl Stamitz and Georg Joseph Vogler, as well as virtuoso ballroom music and comic operas. The publication of the piano scores and first editions of Mozart's opera Don Giovanni and Die Entführung aus dem Serail were among the highlights of the publishing house’s early history. They were soon followed by major late works of Ludwig van Beethoven, including the Ninth Symphony, the Missa Solemnis and the last two string quartets. In the first decades, Schott felt committed to the French tradition popular at that time. The catalogue therefore included names such as Adolphe Adam and Daniel Auber as well as Gaetano Donizetti, Ignaz Pleyel and Gioacchino Rossini. With the works of Franz Liszt and Peter Cornelius, Schott indicated a stronger interest in the German repertoire. In 1859 Franz Schott (1811–1874), the grandson of Bernhard Schott, succeeded in winning the exclusive collaboration of Richard Wagner, and Schott published Die Meistersinger von Nürnberg, the complete Ring des Nibelungen and Parsifal. The connection with Wagner proved extremely expensive for the publishing house: on 21 October 1862, Franz Schott wrote to Wagner: "Anyway, no music publisher can possibly satisfy your needs, this can only be done by an enormously rich banker or a prince who has got millions ..." Wagner did indeed find his generous prince in the person of Ludwig II, the young King of Bavaria..
Schott’s prestigious 20th century publishing programme, now known as Music of Our Time, was initiated by the publication of works by Igor Stravinsky, a close friend of Willi and Ludwig Strecker for many years. Schott published major works, from early orchestral works such as Feu d'artifice and Scherzo fantastique and the complete L’Oiseau de feu (The Firebird) to the Violin Concerto, Symphony in C and Symphony in Three Movements. Schott also published several major scores of Arnold Schoenberg, including Moses und Aron and Von heute auf morgen. Schott established lifelong working relationships with Paul Hindemith and Carl Orff, and this commitment between composer and publisher has defined the character of the catalogue, involving some of the important composers of their time. Hans Werner Henze, for example, joined Schott at the age of twenty, his considerable oeuvre being published exclusively by them for over 55 years. Sir Michael Tippett's lifelong relationship with Schott began in March 1939 when Willy Strecker visited London for the first (concert) performance in England of Hindemith's Mathis der Maler. Shortly after war had been declared, he heard through their London office that Schott would like to publish his Concerto for Double String Orchestra and an early Piano Sonata. "Being a born internationalist I thoroughly enjoyed this outcome and thought it a good omen." György Ligeti, Krzysztof Penderecki, Alexander Goehr and Aribert Reimann have all been published exclusively by Schott for more than thirty years. This close collaboration continues to support the work of many distinguished composers, from Henri Dutilleux to Mark-Anthony Turnage. Peter Eötvös recently joined Schott, as well as several young composers during the last years: Chaya Czernowin, Joe Duddell, Moritz Eggert, Kenneth Hesketh, Christian Jost, Tatjana Komarova, Nicholas Lens, Olli Mustonen, Benjamin Schweitzer, Jörg Widmann and Lei Liang. Schott Music also publishes the film music compositions of a number of modern film composers. Some of the more prominent film composers on Schott's roster include Erich Wolfgang Korngold, Nino Rota and Howard Shore. ^ "About Schott - Schott Music (EN)". Retrieved 2016-07-29. ^ "Contacts worldwide - Schott Music (EN)". Retrieved 2016-07-29. ^ "AKEP Award für Schott Pluscore®Sing-Along" (in German). Neue Musikzeitung. 11 October 2012. Retrieved 19 October 2017.